Batman folded the leather vest and placed it carefully over the package in his dusty, well-worn saddlebag, pulling the leather straps tight and clasping the buckle. Lost in thought, he was not aware of the time spent just staring at the dirty shop floor. It was going to be a bittersweet day. The events that were to take place in a couple of hours made his chest feel heavy, for while proud to do so, he wished the need would never arise. Grasping a faded vest down from the hanger he carefully checked it over. The memories this particular vest brought forward were tangible in his hands. Only worn for occasions such as today's, the names embroidered were all crisp and perfectly stitched and stood in stark contrast to the weathered patch on the back. Names forever etched in his psyche. Today a new name will be added to this roster. A place of dubious honor. The price of admission to this "roll of honor" always came at too steep a price. The scars and nightmares that paid the cost of membership would last a lifetime for the inductee. Putting on the vest Batman allowed himself a moments respite to gather his courage. Glancing at his bike, giving it a once-over look, satisfied that all was in order, he swung a leg over and brought it to life. Today this chariot of chrome and steel would announce to all the world: a new member is part of this international organization. He rolled out onto the street, settled back on the seat and headed toward the designated meeting place. A hundred riders waited for his arrival. Some were members long before the existence of the patch, some were relatives or friends of inductees and some were there as patch holders on the premise of never having to add another member. This organization had the distinction of never wanting to exist, and all who belonged would gladly burn their patch if the club's charter would no more have relevance. Arriving at the staging area Batman watched as the members all gathered in formation for the upcoming ride. Pride filled his stature as he heard the thunderous roar of iron horses come to life. The ground trembled. A sound that would soon announce to the inductee: you are safe now. And to the one who caused the price of admission.......Beware! Jimmy stood on the lawn next to his mother, clutching a torn and tattered teddy bear stained with far too many tears and quietly holding sorrowful guard. This Bear's six-year mission of being the only defense in the world for the boy would soon be joined in force a thousandfold. In the stillness of morning a rumble grew in power and proximity. Jimmy's mother gently squeezed her son's hand and whispered in his ear, "This is all just for you," and pointed in the distance. 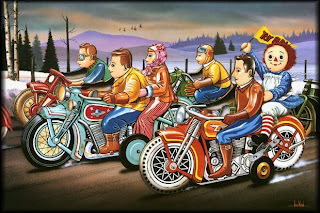 Jimmy's eyes grew wide as the road filled with motorcycles as far as he could see. Waving to him and parking in a circle around his yard the riders dismounted, smiling, and all gathered in front of Jimmy and his mother. Batman stepped forward with the contents of his saddlebag. Jimmy opened the brightly wrapped package to reveal a helmet custom-painted with his name on the front and a painting of the patch that all the riders in front of him wore. Custom-fitted just for him, he eagerly placed it on his head, his hair falling over his forehead. Batman gently brushed his leathered hand across the boy's face and tucked it under. Batman unfolded the small vest in his hands and placing it on Jimmy's shoulders, said to him, "You are one of us now. You no longer have anything to fear. We will always be here for you." Seeing this interaction between the giant bear of a man that is Batman and little Jimmy, who barely grew taller than his kneecap brought those in attendance to near tears. Jimmy could barely contain his glee when asked if he was ready for his first ride. Proudly sporting his Bikers Against Child Abuse (BACA) patch, Jimmy rode with Batman, leading the formation towards his brighter, new destiny.